This map shows the U.S. Forest Service's closure of Basalt Mountain. The Lake Christine Fire near Basalt started Tuesday night at the shooting ranging at the Lake Christine Wildlife Area. Fire crews were on scene there Wednesday morning. A look at the head of the Lake Christine Fire looking northwest on Wednesday morning. 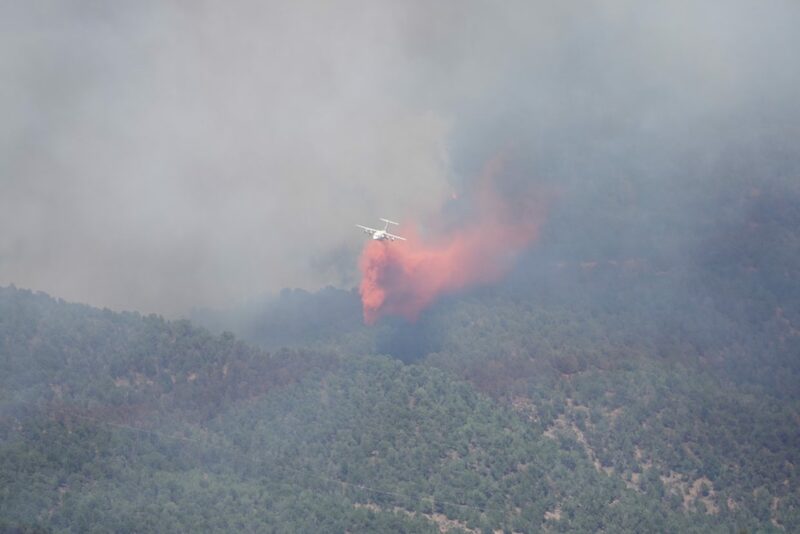 Air crews work on the Lake Christine Fire, which by Wednesday afternoon was at more than 2,300 acres. The Lake Christine Fire started Tuesday night and grew to nearly 2,300 acres by Wednesday afternoon. 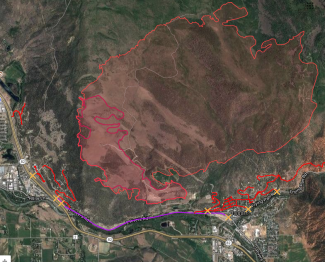 A map as of 7 p.m. Wednesday shows the nearly 3,000 acres that have burned in the Lake Christine Fire near Basalt. 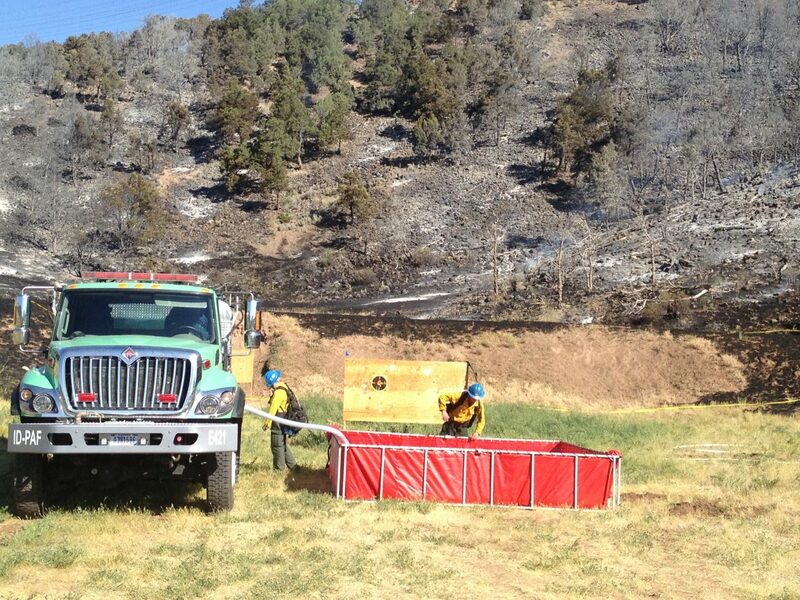 Fire crews gather near Aspen Junction as they work the Lake Christine Fire on Wednesday morning. A look Wednesday morning at the Lake Christine Fire near Basalt. The red marks the area that has been burned by the Lake Christine Fires, about 320 acres, as well as roads that are closed and blocked off. More than 500 homes were evacuated by Wednesday afternoon. People watch as the Lake Christine Fire burns Wednesday afternoon near Basalt. A look at the Lake Christine Fire on Wednesday afternoon about 2:30 p.m. from the Deadwood Ranch. A helicopter drops water on the lower slopes of Basalt Mountain at about 7 p.m. Wednesday. 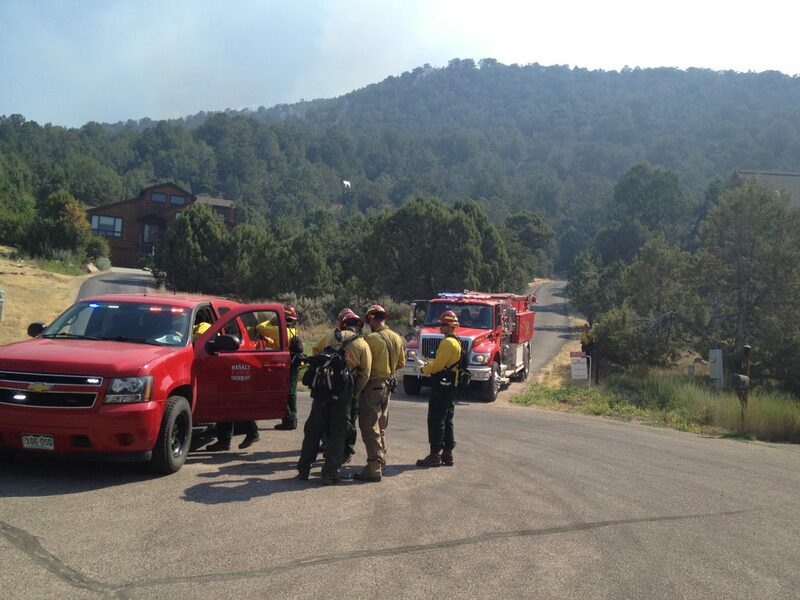 Fire officials said an estimated 500 homes are threatened by the Lake Christine Fire. A plane drops slurry on at the Lake Christine Fire on Wednesday afternoon about 2:30 p.m. from the Deadwood Ranch. Fire crews work the Lake Christine Fire on Wednesday morning near Basalt. 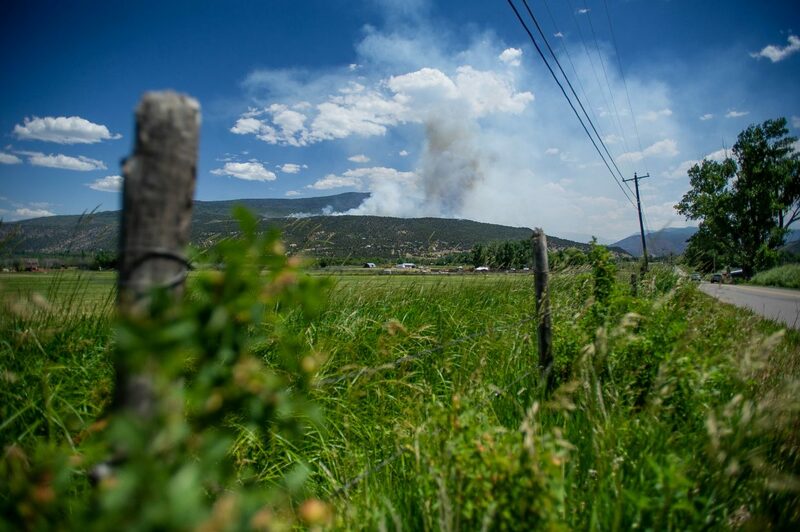 Officials are concerned about the wooden power poles in the burn area and if they fall it could cut power in the Roaring Fork Valley. 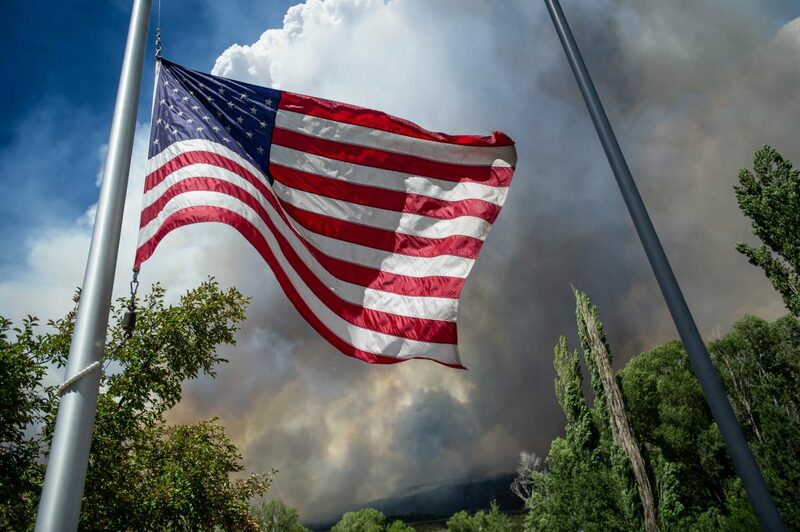 The Lake Christine Fire evacuations spread to Missouri Heights early Thursday as gusty winds continued to blow the fire to the north and make conditions unpredictable. Authorities issued a mandatory evacuation notice for Missouri Heights at 12:47 a.m. “All residents in Missouri Heights should evacuate immediately,” the alert said. “Evacuate via Fender Lane to Catherine Store Road, then take (Highway) 82.” Roaring Fork High School has been designated as a shelter. Just as the wind died and the fire seemed to lay down conditions turned in a split second. Flames rolled over the ridge and wind gusts pushed the flames to the north high on a ridge above the El Jebel Mall (where Bella Mia is located) and the mobile home park. Conditions changed to drastically that the incident command center had just posted a Facebook note at 9:30 p.m. saying it would be the last notice of the evening. 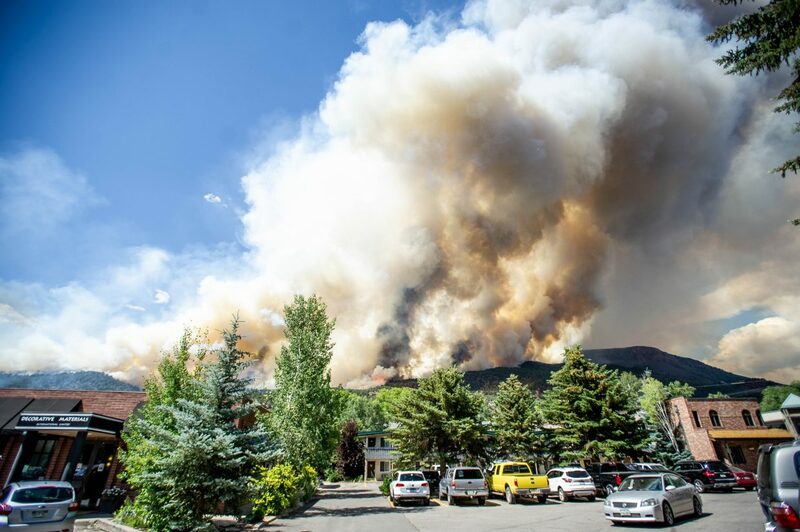 Minutes later, residents of Sopris Village, Summit Vista, El Jebel Mobile Home Park and Blue Lake were all wondering should I stay or should I go. Some people fled to Carbondale and Glenwood Springs. As of 10:20 p.m. it was unclear if flames reached the valley floor. 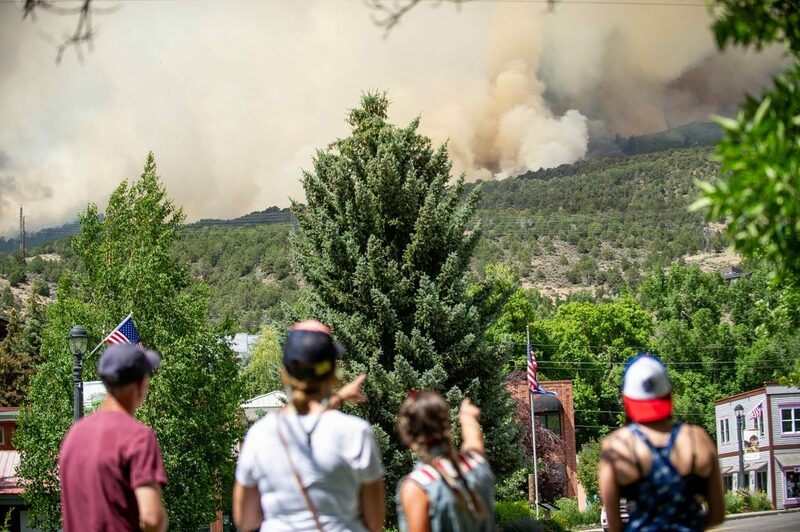 Earlier in the day, the fire expanded so drastically that emergency response official said hundreds of homes were threatened by a blaze described as “erratic” Wednesday night at a community meeting at Basalt High School. 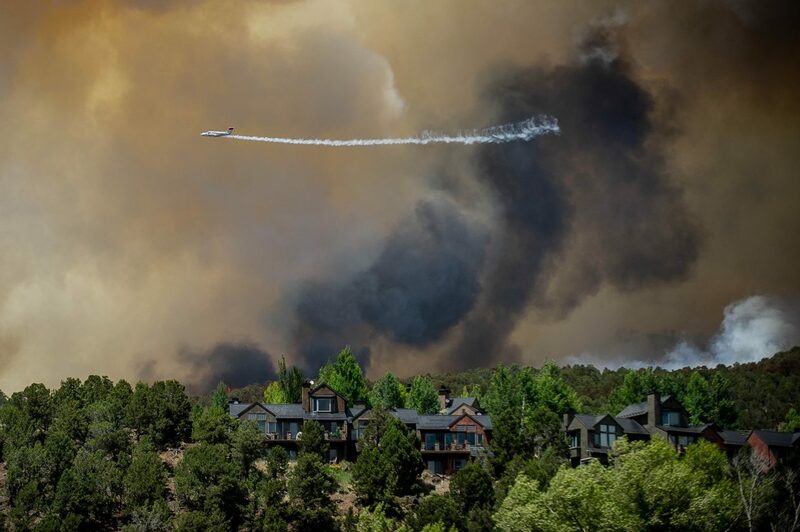 There were an estimated 114 homes at risk Wednesday morning before the fire expanded in dry hillsides in the midvalley — before the fire made a “run” as winds and temperatures picked up later in the day, according to Basalt Fire Chief Scott Thompson. “We’re estimating there are 500 homes in the path of this fire (now),” he said at the meeting. The only area of containment is where the fire started, at the Basalt shooting range, he said. 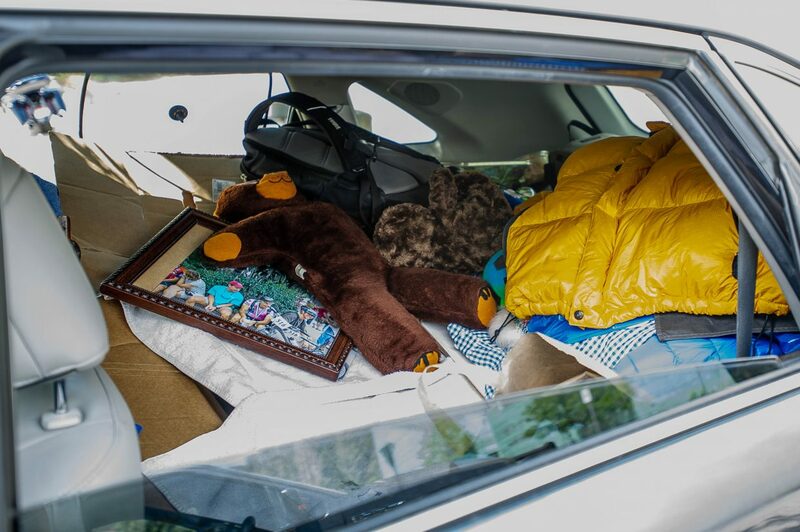 Mandatory evacuations were ordered for an estimated 219 households with pre-evacuation notices to another 154 households, according to authorities. Scores of evacuated residents attended the community meeting and wanted to know prospects for returning home. A mandatory evacuation notice was issued at 9:40 p.m. for the El Jebel mobile home park after the fire crested the ridge above El Jebel. 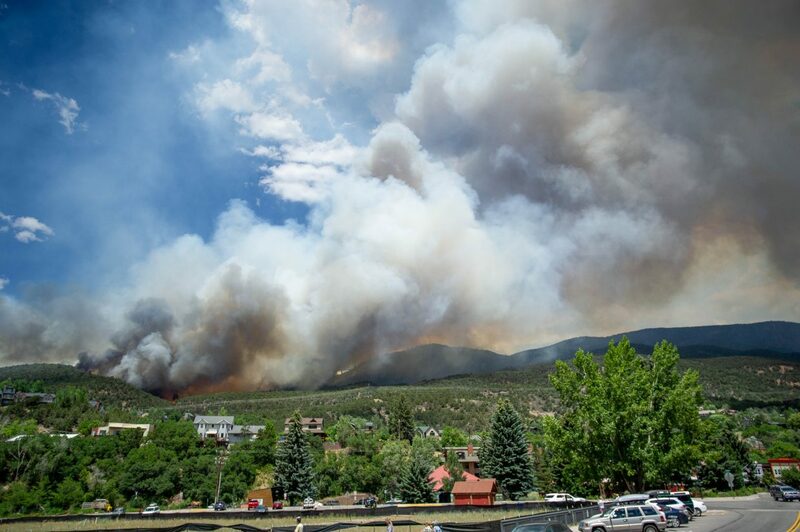 “This area is at immediate risk from wildfire,” a Pitkin County alert said. An intense firefighting battle unfolded throughout Wednesday afternoon and into the evening to prevent the fire from cresting the ridge across Highway 82 from Whole Foods in the El Jebel area and to prevent the fire from sweeping too far down the hillside toward Old Town Basalt. 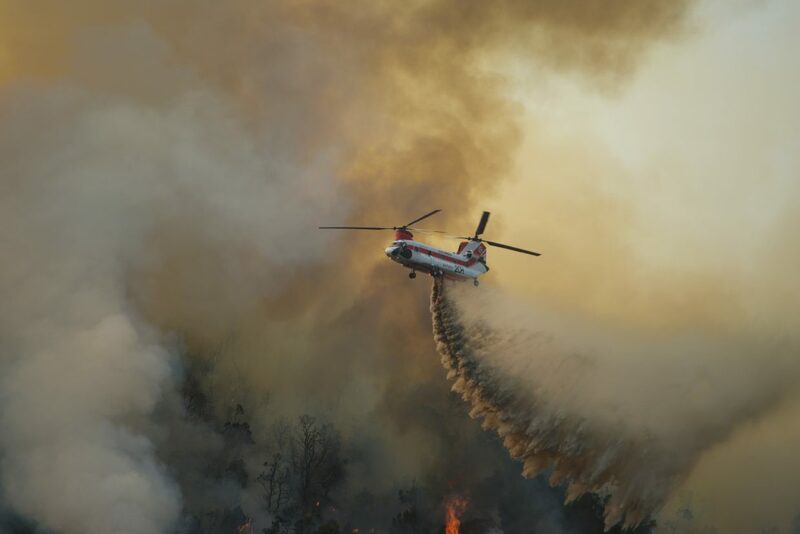 Helicopters worked nonstop from about 10 a.m. to 8 p.m. to dump water on flaring patches of fire while small and large tankers dumped load after load of retardant ahead of the flames. 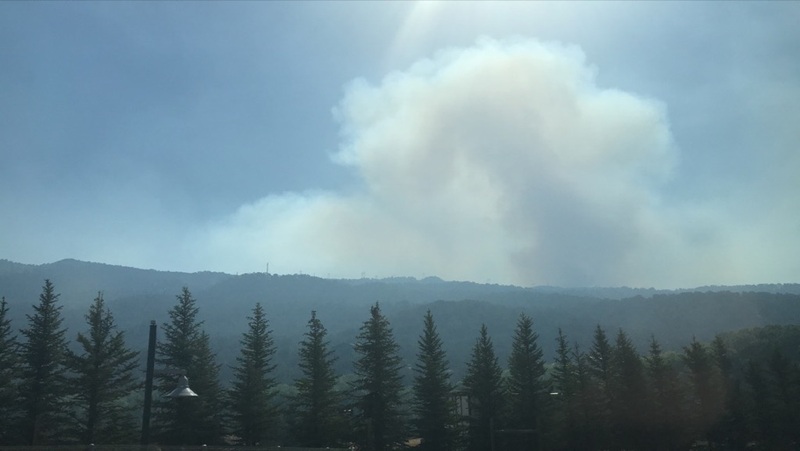 The midvalley looked, sounded and smelled like a combat zone Wednesday with a constant buzz of aircraft battling the wildland fire, black and white smoke rising in dramatic columns and the smell of charred vegetation hanging in the air. Gray ash covered the midvalley in the morning. The activity carried over to the afternoon. 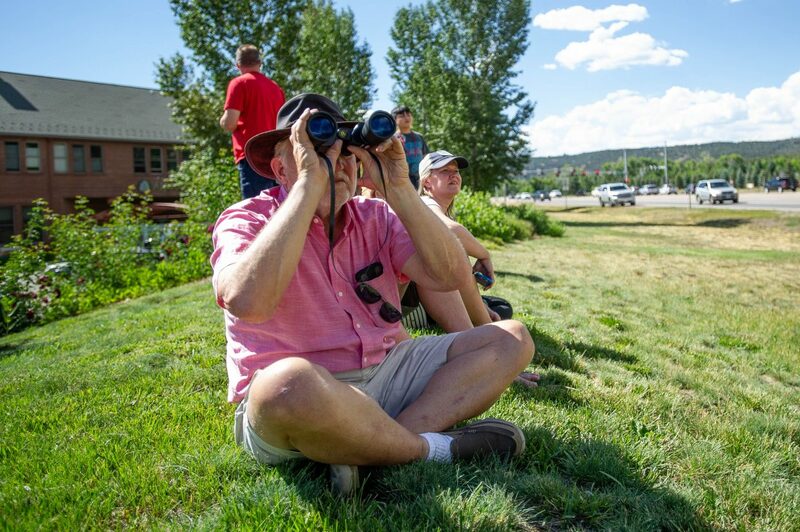 Hundreds of gawkers were parked along Highway 82 and secondary roads in awe of the display. 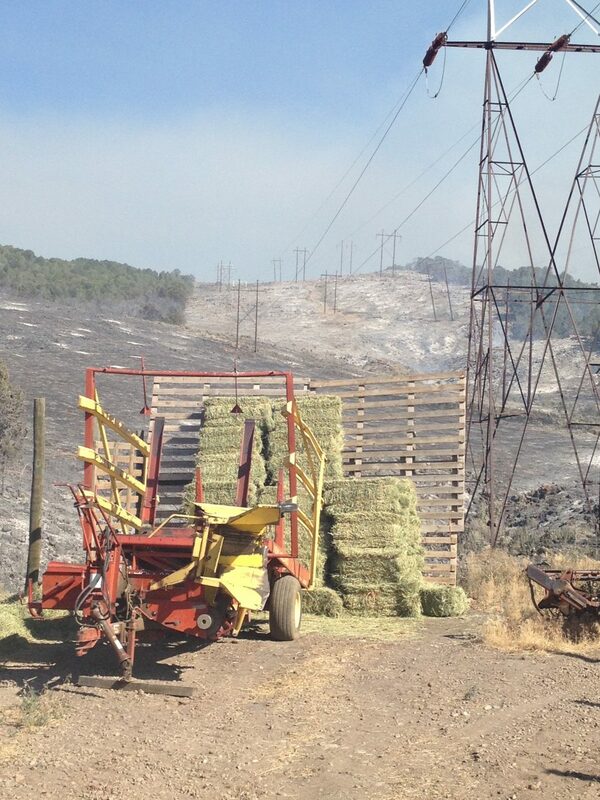 The fire was at about 330 acres mid-morning Wednesday. Thompson said it was nearly 2,700 acres as of 7 p.m. He said there are 150 federal and local firefighters battling the blaze. 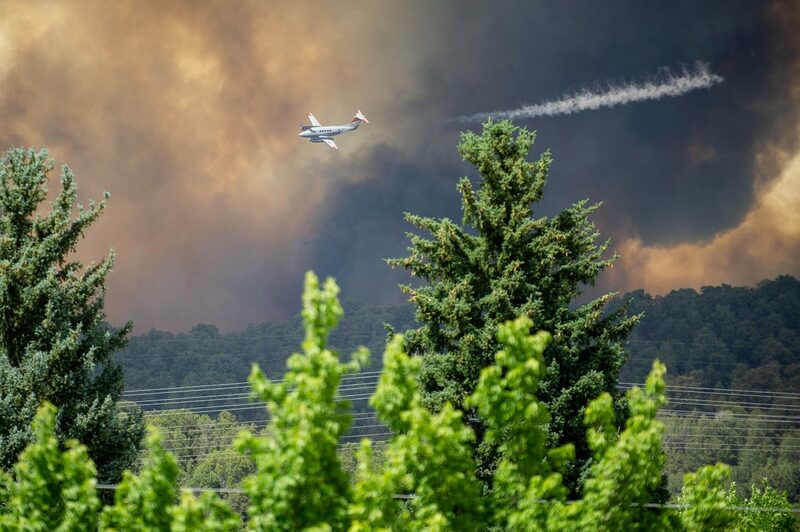 The goal was to get the ground crews back in action after the helicopters and air tankers finished their drops of water and retardant. 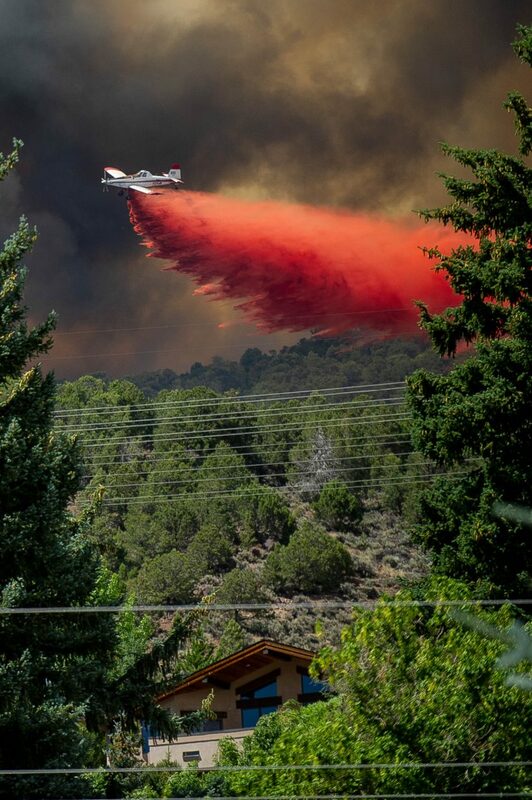 The aircraft worked nonstop starting from late morning and stopped for the night at about 8:30 p.m.
Thompson said federal firefighting agencies dedicated four 20-person hand crews to the effort, seven small air tankers (though one became disabled when a tire blew during a resupply landing), four heavy air tankers and two helicopters. “We ordered four more 20-person teams,” he said. Thompson was apologetic to the crowd at the community meeting for the fire exploding on the Fourth of July. The firefighters put a lot of emphasis Tuesday night on the right or easterly flank of the fire, which started at the Basalt shooting range. The goal was to protect downtown Basalt and the hillside residential neighborhood from the typical prevailing winds from west to east or upvalley. Thompson said the wind shifted direction, potentially saving homes from burning in the hill district. He said he hasn’t seen that drastic of change in wind direction in the evening in nearly 40 years of fighting fires in the valley. The crowd didn’t feel the firefighters failed. They applauded the firefighters for their efforts battling the blaze. Thompson said federal officials will take over command of the firefighting effort Thursday. 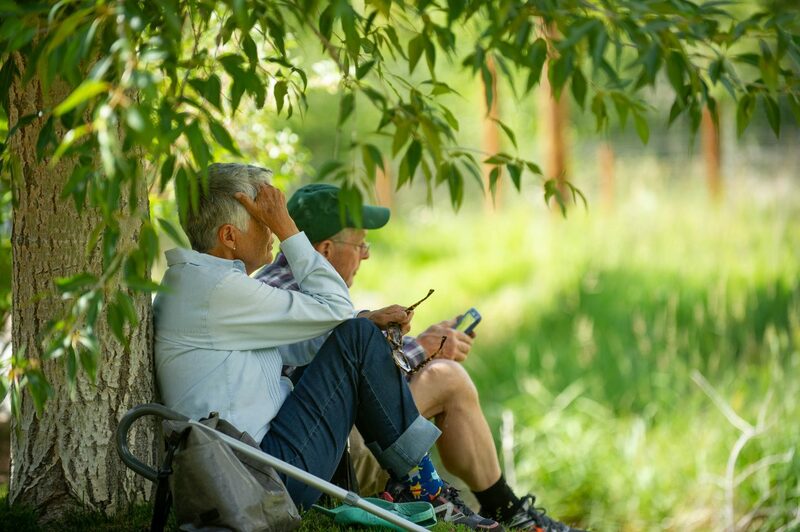 An administrative team of at least 50 people will establish a command post at the Eagle County office building and other property adjacent to Crown Mountain Park. 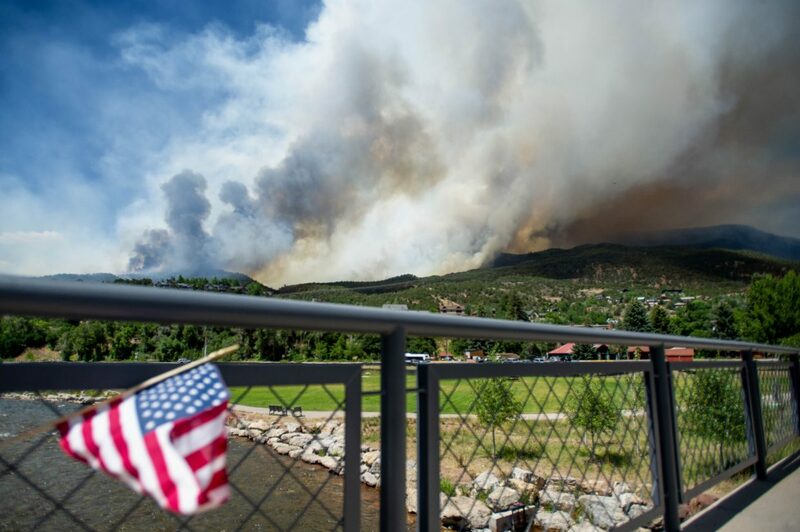 The Federal Emergency Management Agency announced Wednesday night it authorized use of federal funds to help the firefighting effort. 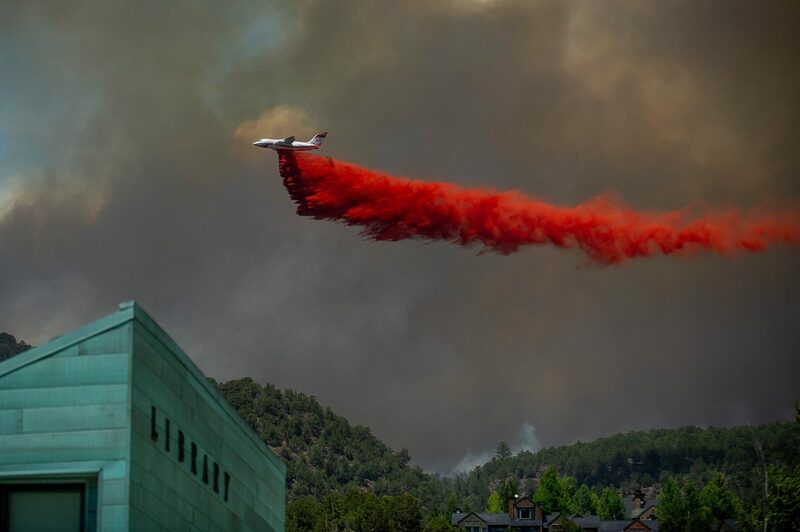 Officials are expecting the Lake Christine Fire to burn possibly for weeks after it expanded so drastically Wednesday afternoon. 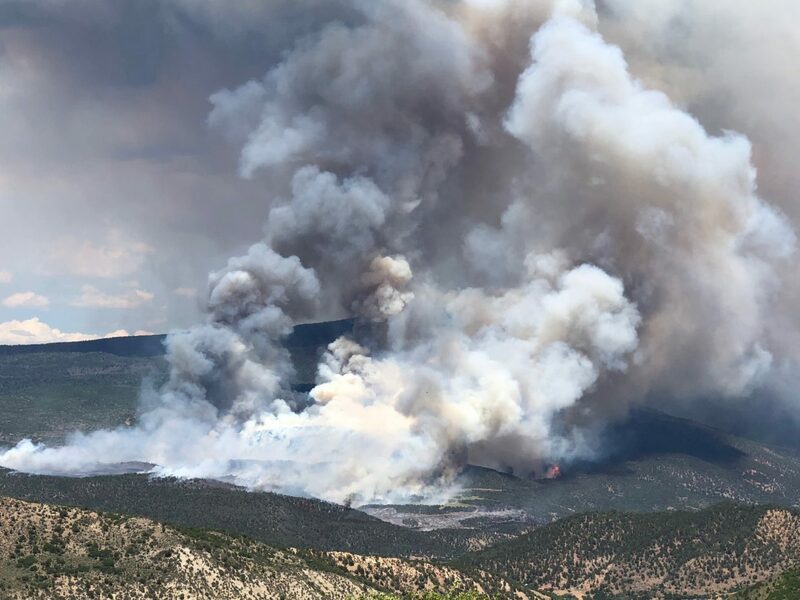 “Without a change in the weather it’s going to be burning in and around Basalt Mountain for a significant amount of time,” White River National Forest Supervisor Scott Fitzwilliams said prior to the community meeting. “Yeah, there’s a chance it’s going to go to the top of Basalt Mountain,” he said. 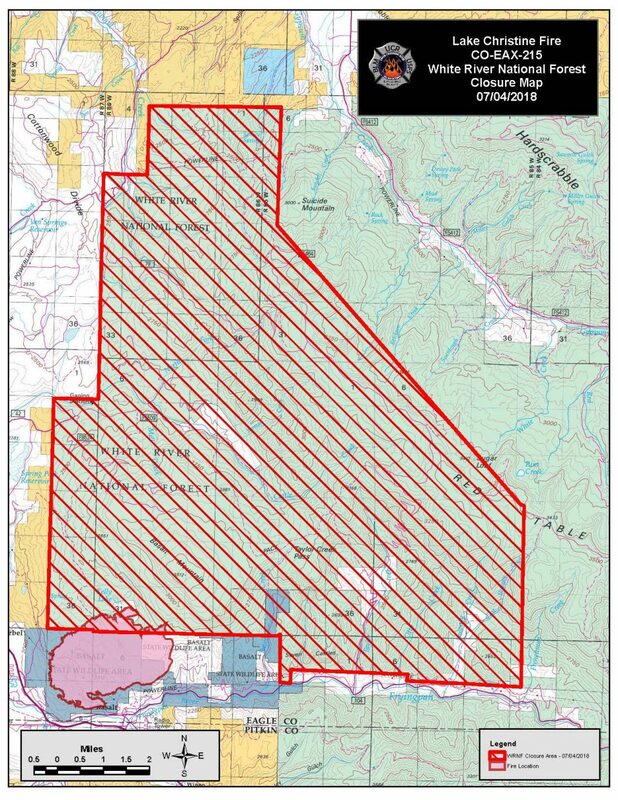 The White River National Forest enacted a closure order to prohibit access to Basalt Mountain to the ridge of Red Table Mountain. 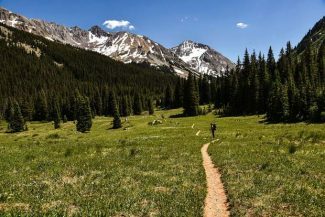 Forest Service officials were sweeping the popular recreation area to alert campers, cyclists and hikers to vacate the area before gates on access roads are locked, Fitzwilliams said. A portion of the Lake Christine Fire is running to the north toward Basalt Mountain. 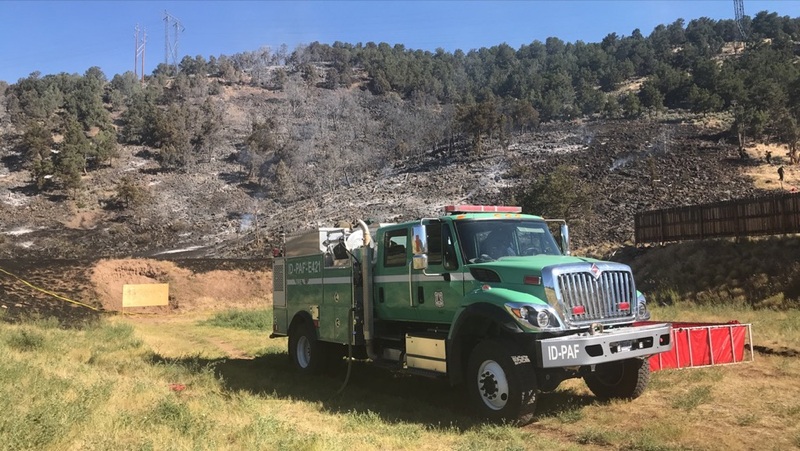 The fast-growing fire spread from the Basalt State Wildlife Area to lands administered by the Bureau of Land Management and Forest Service, Fitzwilliams said. 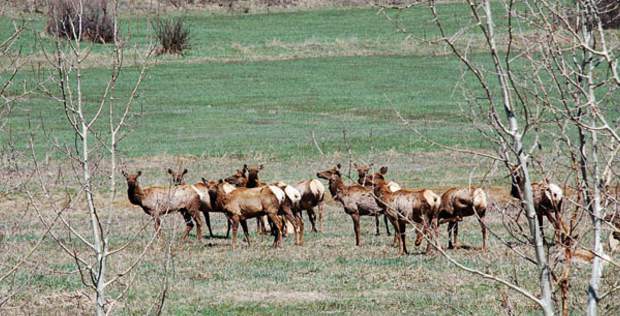 Extension onto unpopulated national forest might be the least of the problems. 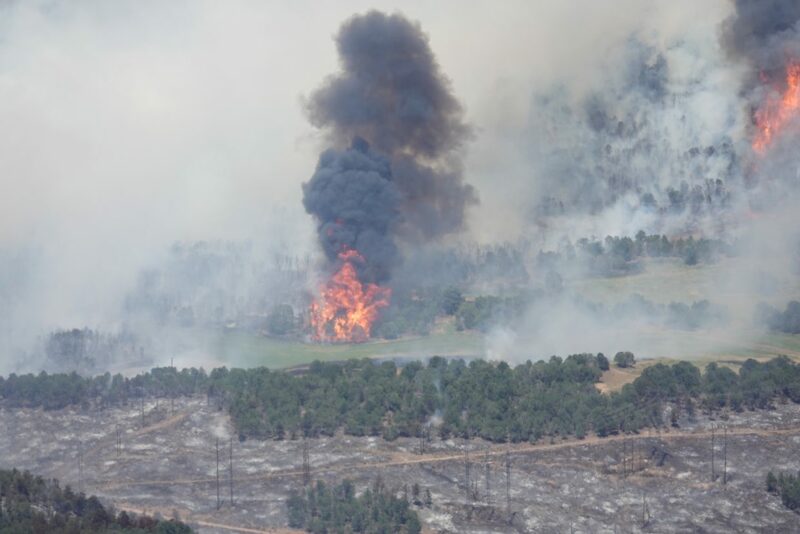 The fire was threatening homes in and around Basalt as well as posing a risk to damaging enough of the electrical infrastructure to put the upper valley in the dark. A Pitkin County alert said the valley above Basalt should be prepared for a possible power outage for up to 72 hours. 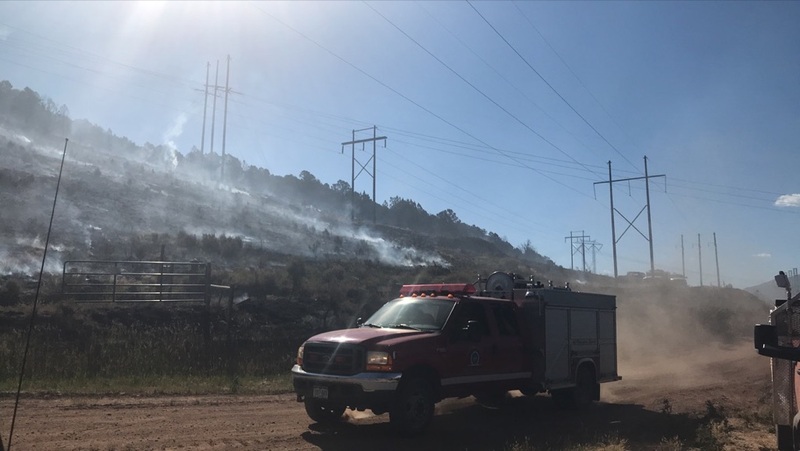 Thompson and other firefighters said the fire is “complex” because of the extensive system of power lines in the area near the shooting range. In a tour of the burned area Wednesday morning, Carbondale Fire Department captain Jake Spaulding showed a reporter and photographer from The Aspen Times how the fire had destroyed wooden power poles. The lines were resting on guy wires. “We’ll go around put the fire at the base of those power poles out,” he said. But the danger of lines falling prevents hand crews on the ground from working under or around the poles. 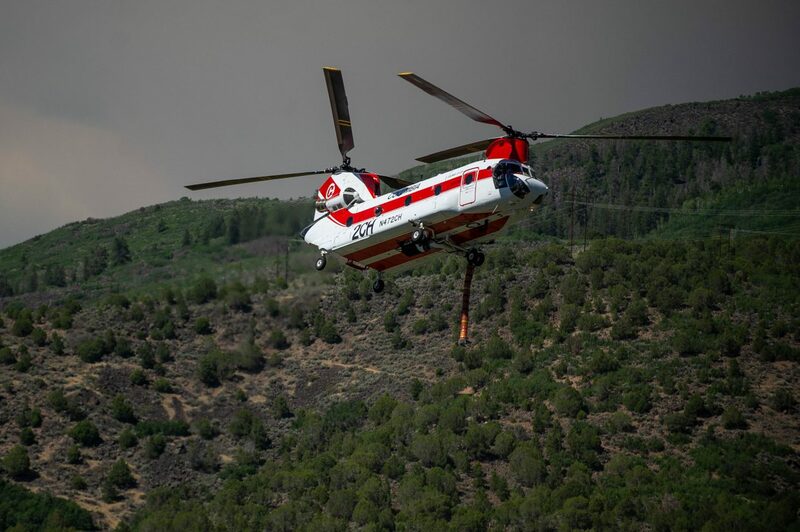 It also restricts flexibility for the helicopters and airplanes used in fighting the fire. 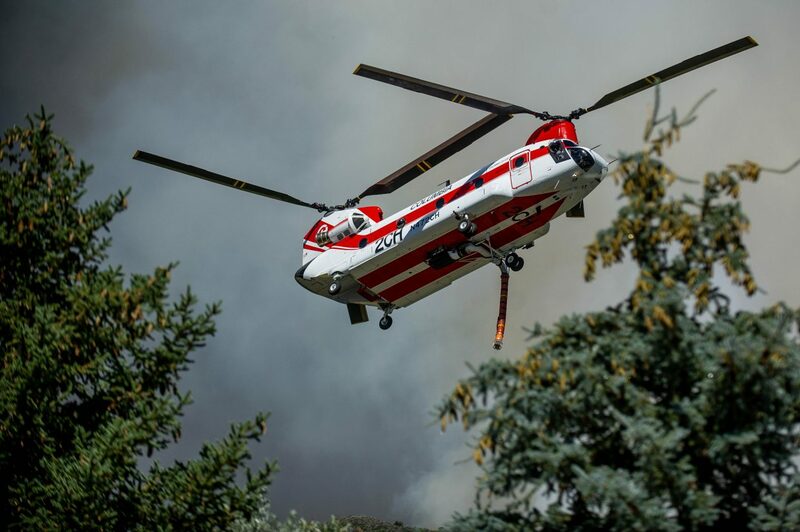 Additional evacuations were ordered in Basalt on Wednesday afternoon as federal and local firefighters struggled to get a grip on the fire. 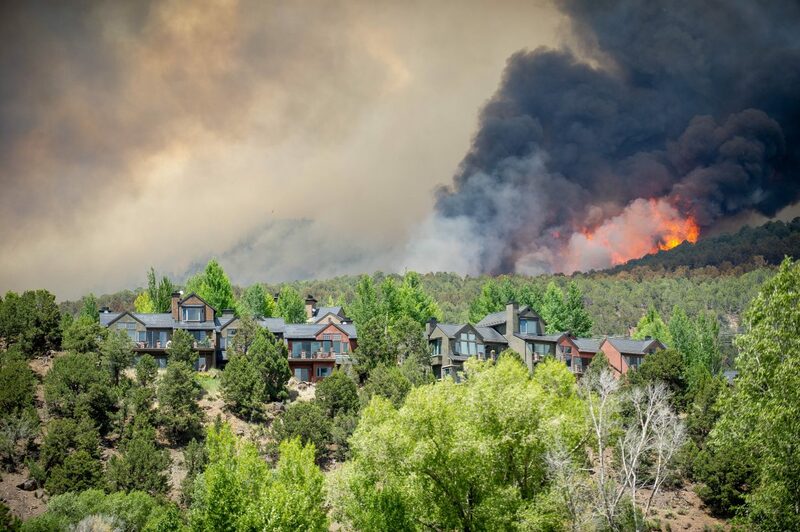 Officials ordered the evacuation of Homestead Trail Park, the Wilds development, Ridge Road, Pinion and Cedar Drive at 12:50 p.m. All those neighborhoods are in the hills above downtown Basalt. 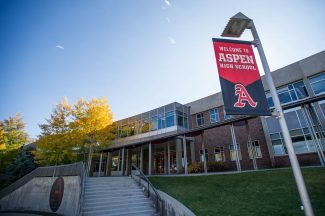 A shelter was established Tuesday night at Basalt High School. 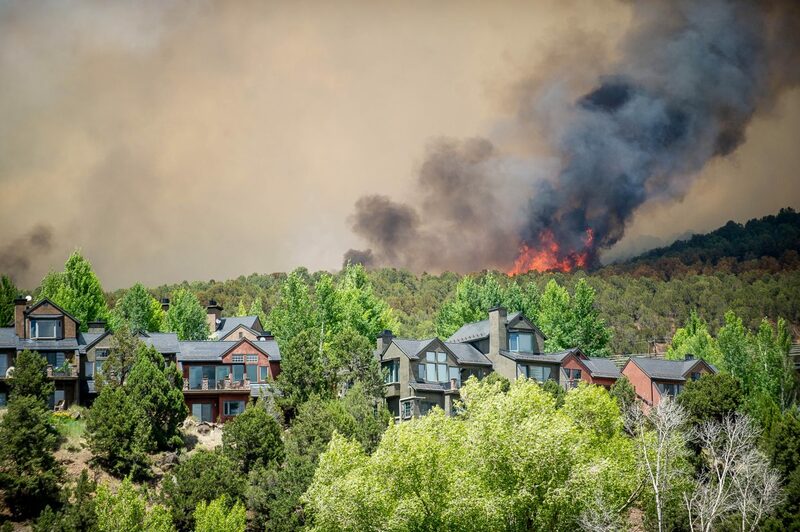 At 1:24 p.m., the evacuation order was expanded to include Homestead Drive, Sopris Drive, Tucker, Hillside, Longhorn and all addresses on the north side of Midland Avenue. That demonstrated the rapidly changing conditions. A pre-evacuation notice was issued for those neighborhoods just 12 minutes earlier. 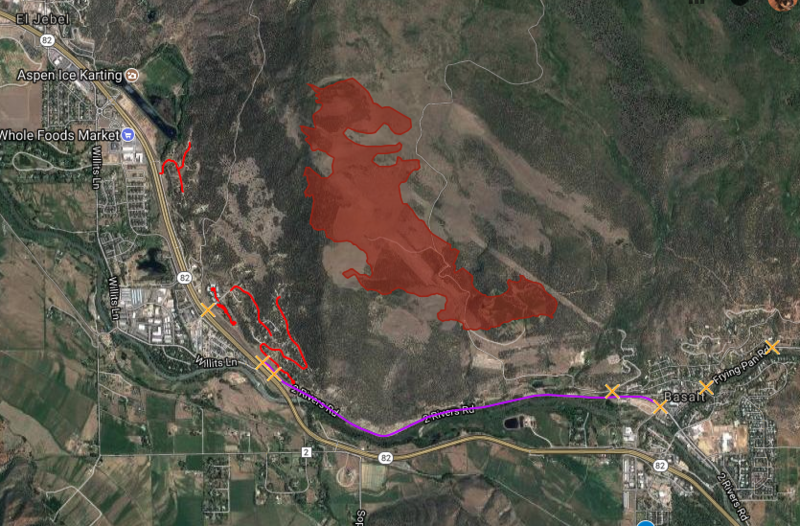 Further evacuation orders, if any, will be posted on the Facebook pages of the Eagle County Sheriff’s Office and Carbondale Fire Department. Emergency responders urged people not to call 911 to inquire about the evacuation orders because dispatchers have their hands full.